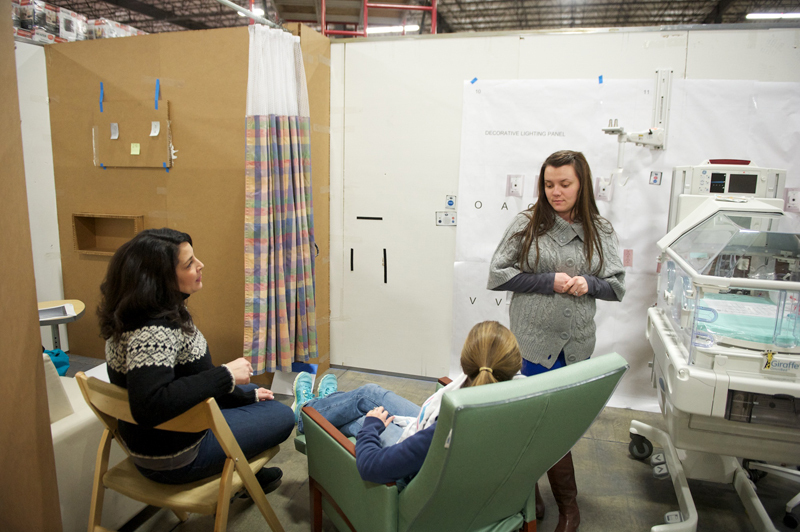 NICU family care coordinator Mary Beth Frye, Megan Pollock and nurse Sofiya Lizhnyak participate in a NICU simulation to test the new design space. Akron Children’s Hospital’s NICU team began its final design kaizen with an approach that could be compared to speed dating. The team broke into three small groups that rotated around full-sized cardboard mock-ups that represented patient rooms, medication rooms, team rooms, family and staff quiet rooms, supply and equipment rooms, pod work stations, and remote networking or “touchdown” rooms. Each group had 45 minutes to review and discuss where every stationary and portable item should be placed in each room. During a simulation scenario, Dr. Jen Grow and Megan Pollock test out the design of the new patient rooms. 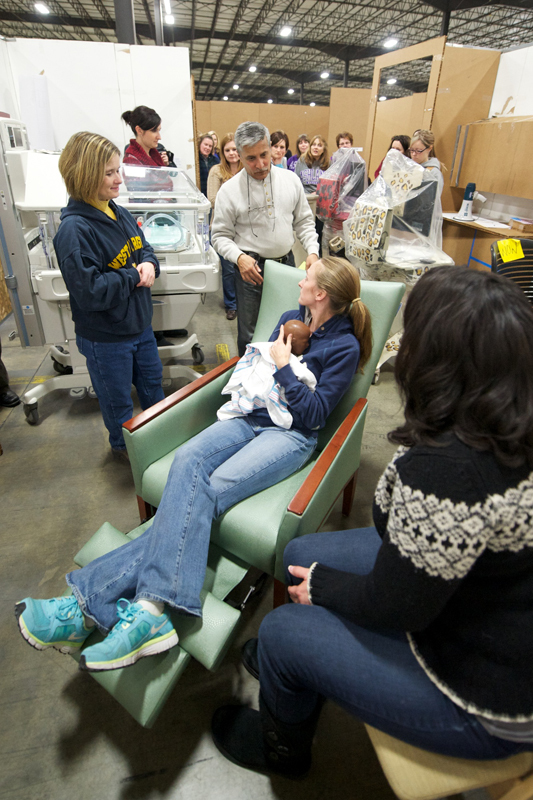 The teams took the needs of NICU families into consideration – everything from how to provide coffee and tea service most economically and efficiently to the need for recliners in the quiet room for parents to hold their end-of-life babies. “It’s been great to be able to give input on everything from the chair position in the patient room to the counter space and cabinets in the bathroom,” said Megan Pollock, a former NICU parent. How many and what types of seating are required? How many phones and chargers for communication devices are needed? What types of storage work most efficiently in different rooms? Would white and cork boards be useful or compromise patient privacy? What size windows provide the best compromise between visibility, privacy and cost? What’s the best location for the breast milk and formula refrigerator and the meds refrigerator in the medication room? Could crash carts be stored in the medication room? Where is the best place to locate sinks to avoid splashing and possible contamination? Are clutter free counters with storage shelves above the best approach? Who will be responsible for cleaning and stocking items? After the NICU team agreed on changes, they used simulation scenarios to confirm that they knew where to find what they needed and make sure the newly designed spaces work as planned. The NICU team will now embark on two years of process refinement during the Critical Care Tower construction, culminating in the move to their new space in 2015.